Today I want to share with you my favorite way to emphasize detail. The cabinets in our house were all flat faced when we moved in. Great look of the 60's (uh-huh). The good thing is that when you have flat cabinet doors, the skies the limit to what you can do! 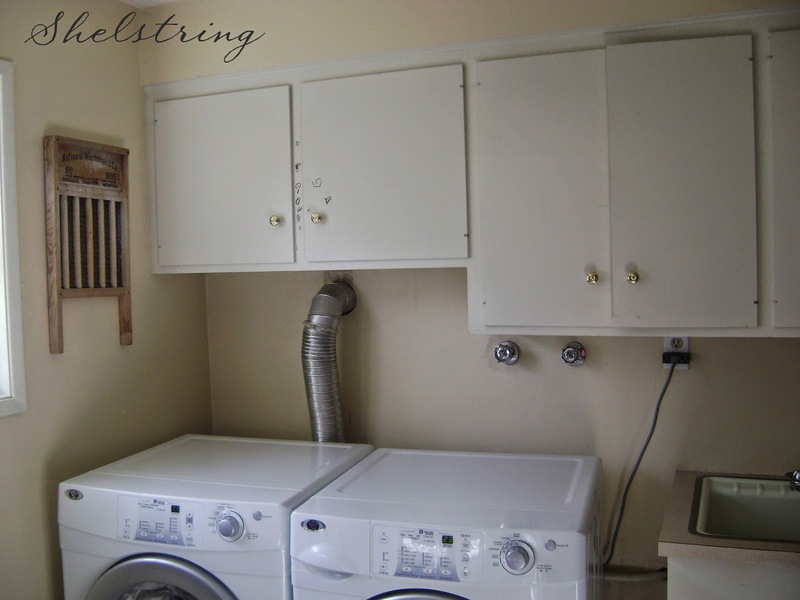 Especially for this laundry room, it was necessary to do something that would help detract from all the unsightly necessities. You know, like that vent duct and totally appreciated outlet (you see in the picture above). So I decided to frame them with a flat fir stripping followed by a bead board insert. 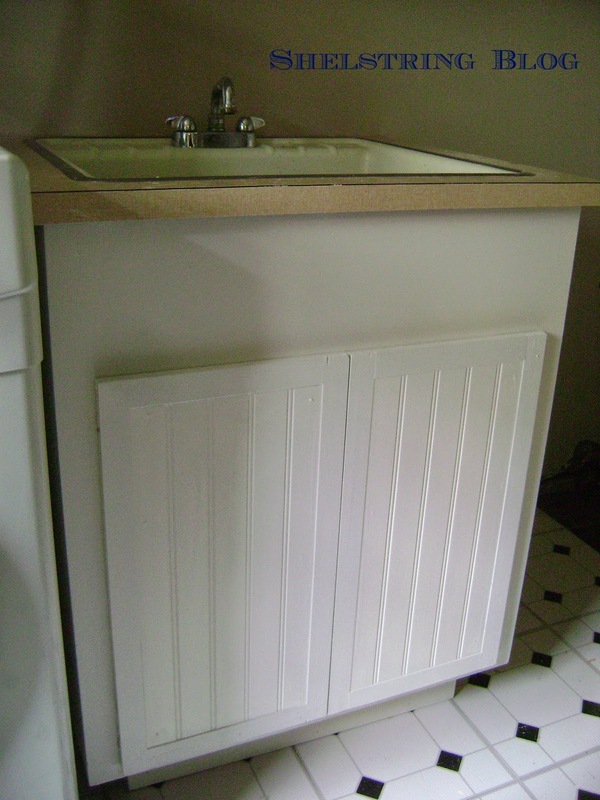 I like the look of bead board in a laundry room. I think it's so washroom-classy. After I painted them, although it was a BIG improvement, I just wasn't satisfied. Immediately I knew what technique I wanted to use... one that I do often that sorta looks like a glaze. The problem was that I wasn't sure of the color. Typically I've used warmer toned stains with this technique, and that tone wasn't what I was going for in here. I wanted it to be lighter. Rather than just rush myself into getting it all done quickly, I decided to think on it for a day or two. Finally one afternoon, it hit me! I thought of this stain I purchased on the mis-mixed paint rack at our local home improvement store that I was keeping around for this other project I want to do. It was a weathered grey color. It was exactly what I imagined in my mind! 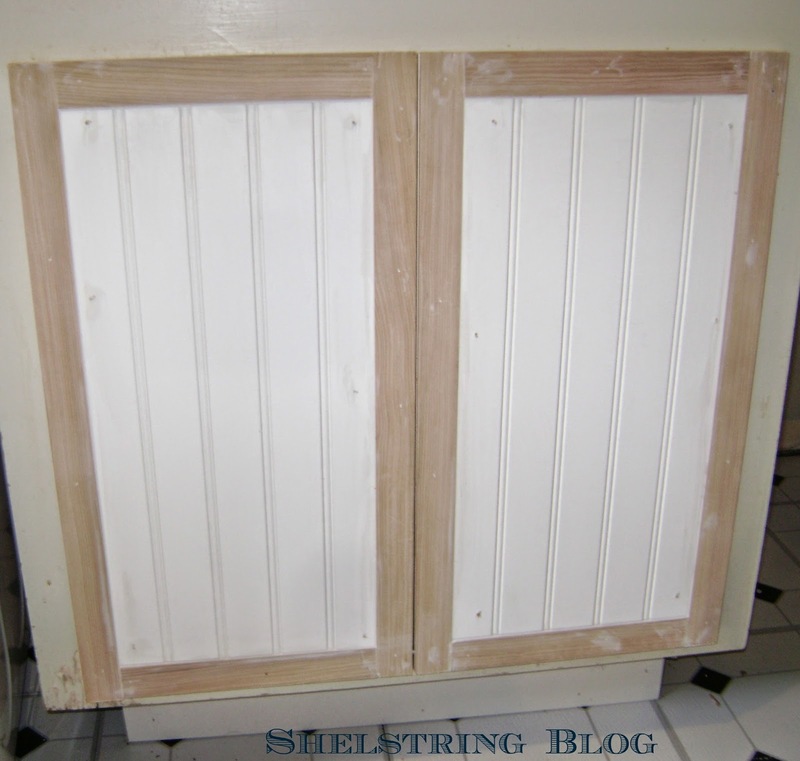 2: Face and Paint doors with desired look and undertone color. 3: Wipe in stain with rag or brush. 4: Use dry, clean rag to wipe down excess so stain only remains in crevices. 5: Continue wiping until desired look is acheived, turning rag regularly. With this technique, you get into a certain groove when you start accomplishing the look you are trying to acheive. Once I finished, I was pleased that my cabinets finally added the character to the room that I was looking for! If you are doing this for the first time, it is good to practice on a room like the laundry room where you can't go wrong, or a piece of inexpensive furniture. That way you can get a feel for how to do it without messing up an important piece. Even then, the good thing about paint is that it can be easily changed. 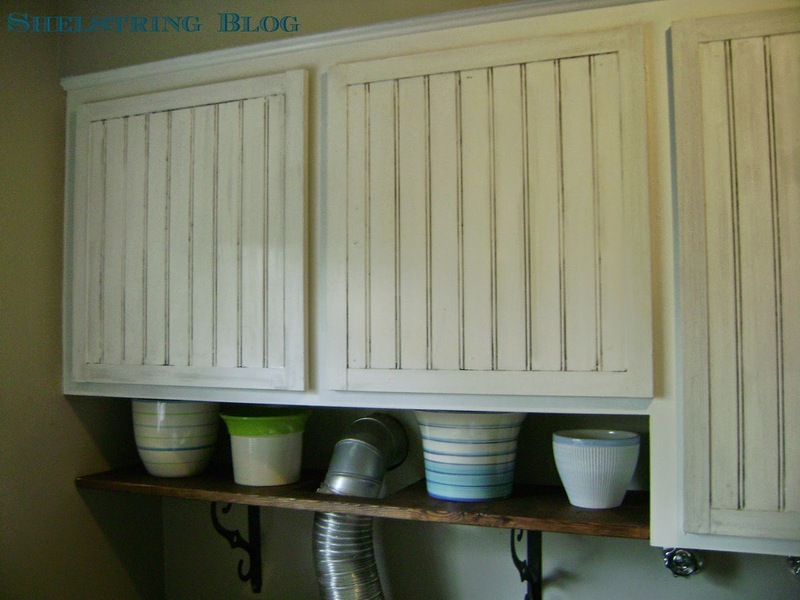 To see a few other projects I did using this technique, check out my Pie Cupboard, using minwax pecan stain, or my Raingutter Antique Dresser, using the puff paint technique with walnut stain, and the Back Door using minwax cherry stain. Got any techniques that are a no fail for you? Do share! Pretty neat, huh? This technique has been one that I have really benefited from once I discovered it. This way the stain acts as a sealer to. Double win! This looks beautiful too. 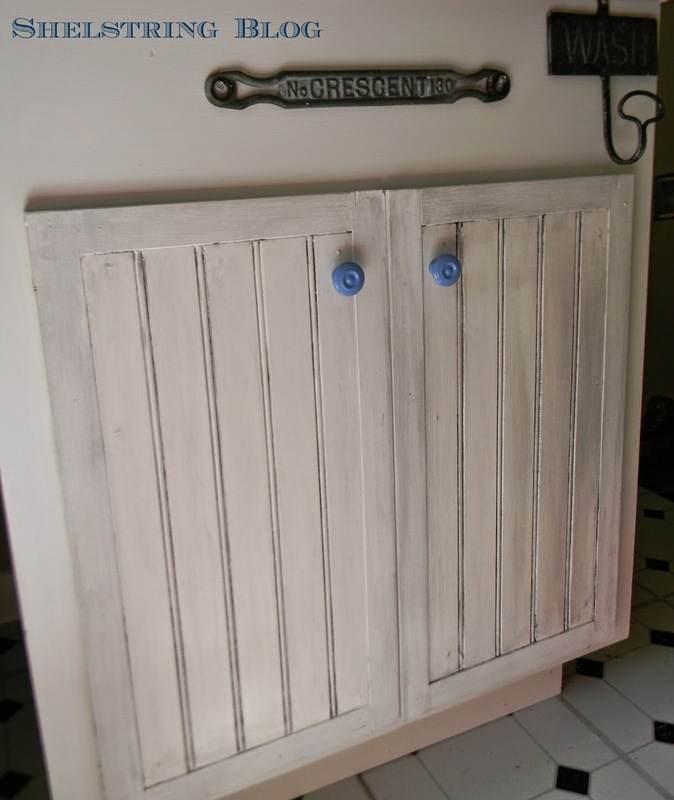 Love it all, the beadboard, the weathered look AND the blue knobs. too cute. Pinned. found this morning at brag about it linky. Have a great week. Thank you Rachel, I'm so glad you dropped by!! Brilliant way to give it a warm farmhouse feel! :) Love beadboard. Pinning to the Trash 2 Treasure Tuesday board - thanks for sharing!